* PDFs are immediately sent to your email upon purchase. * PDFs with Studio License permit teachers to make up to 20 copies for their students. • Spiral-Bound Books ship only to US addresses. Shipping is $4.00 per order. An introductory Pattern Play series that introduces the materials of music (scales, intervals, and chords) in creative and musical ways. Learn about the new features and how it works. 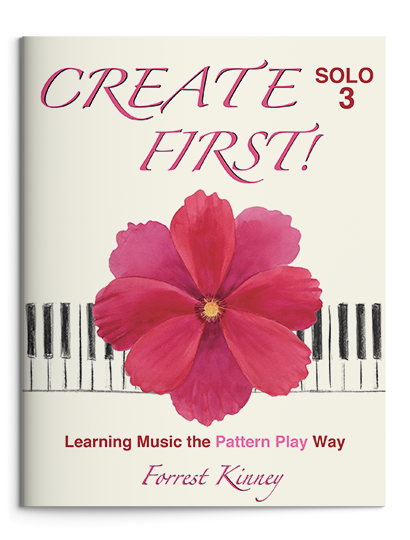 This first book in the series explores Musicality on Black Keys and then Scales on White Keys. Download, print, and enjoy! Each of the 29 pieces has a Bottom part and a Top part. The Bottom part is usually played by the teacher, and the Top part is improvised by the student. The pieces in the Duet 1 book are now presented so a person can play them alone (Solo). In general, the teacher first plays the Duet version in the lesson, then student plays the Solo version at home. The 29 pieces in this book explore Intervals on White Keys and then Chords on White Keys. Download, print, and enjoy! The pieces in the Duet 2 book are now presented so a person can play them Solo. This discounted set includes Duet 1, Solo 1, Duet 2, and Solo 2. Twenty-seven new Patterns featuring scales and modes that have an F-sharp in the key signature. The pieces in the Duet 3 book are now formatted so they can be played Solo. This set includes both PDFs at Level 3: Duet 3 and Solo 3. * Spiral-bound books can only be shipped to USA addresses. Shipping cost is $4.00 per order. This book includes the Duet 1 and 2 books. They have been spiral-bound together for easy use at the piano. This book includes Solo Books 1 and 2. They have been spiral-bound together for easy use at the piano. Two spiral-bound books — Duet 1 and 2 (bound together) and Solo 1 and 2 (bound together). This book has twenty-seven new pieces featuring scales and modes that have an F-sharp in the key signature. The twenty-seven pieces in this book are now formatted so they can be played Solo. Get both spiral-bound books at a discount. Con estos libros descubrirás una manera natural y fascinante de aprender a improvisar en el piano. Empezarás a crear desde el primer momento usando los elementos básicos de la música, como escalas, intervalos o acordes. Poner la creatividad por delante no solo desarrollará tu imaginación y tu musicalidad sino también tu sentido del ritmo, tu coordinación, tu técnica, tu comprensión musical y tu oído. Para los libros en español, haz clic aquí. The Duet-to-Solo approach (used in the new Create First! 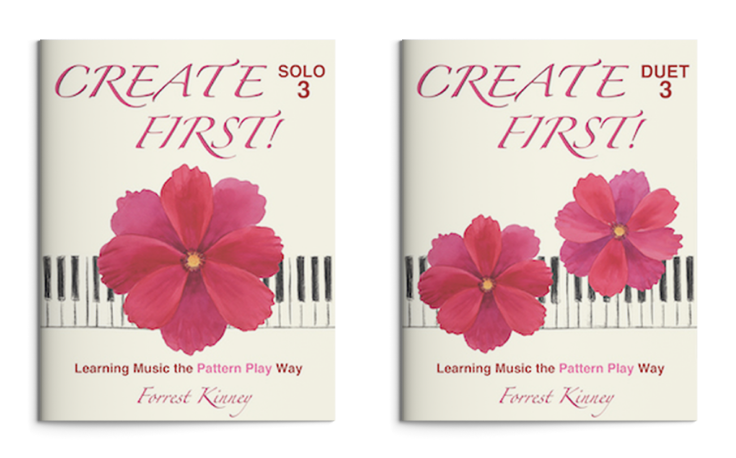 series and in the Pattern Play series published by the Royal Conservatory of Music) has proven to be the most reliable and successful way to begin improvising, so I recommend that beginners and their teachers start with either of those series. Later, add the original Pattern Play series which offers 233 Patterns for improvising with the major scales, minor scales, and the various modes in all the keys. Note: Printed books are available in the US only. Shipping is just $4 per total order. This 144-page book explores ways to create melodies (improvise) with the most popular scales in classical, ethnic, jazz, and popular styles. 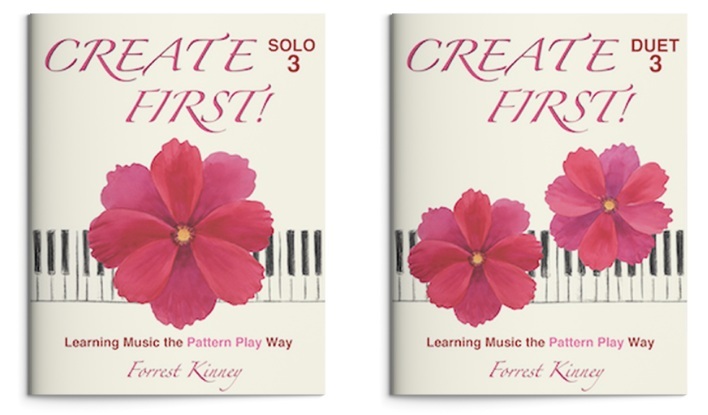 This original Pattern Play book (first published in 2004) can now function as an in-depth “teacher’s handbook” for the Pattern Play series published by the Royal Conservatory of Music or the Create First! series. It offers a more in-depth exploration of solo playing for many of the pieces in the newer series. This book comes with a CD that has 31 solo improvisations on the various pieces and also 4 duets. With 104 pieces made with Patterns in all the major and minor keys. It explores various way to create melodies in diverse musical styles and introduces ways to begin creating your own accompaniment Patterns. It is ideal for those who have worked through Create First! 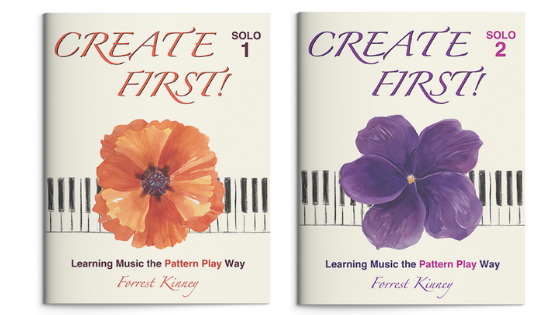 or the new Pattern Play series published by the Royal Conservatory and who are looking for new Patterns in all the keys. Watch a video of a duet improvisation from Melody, Volume Two. I’m joined by Akiko Kinney, who gave me insightful editorial guidance on this book and made many invaluable contributions to the Pattern Play project. Once you are on YouTube, you will see the list of other videos we made that are available for viewing. Each of the 96 different pieces offers another way to improvise in one of the modes (Dorian, Phrygian, Lydian, Mixolydian, and Locrian). This book explores these modes in all keys. It comes with a spiral binding for ease of use at the piano. With the purchase of this set, you’ll receive all three of the original Pattern Play books. The series published by RCM Publishing from 2010 through 2012. Books in this series are no longer sold on this website. You can purchase them directly from the publisher at rcmpublishing.com, or visit a retailer.